Some of you may remember earlier this year I gave away a pair of custom designed mittens, well I finally finished them! The winner, Beth, asked me to design something with an art deco design in black, silver and jade green. I think these fit the bill. I will admit to you that these mittens were a challenge for me. I am comfortable knitting with two colors, but three took me a little (read that as a lot) more time. (Actually, most of the extra time was spent untwisting the colors.) I feel a lot more confident about using more than two colors in a row now. If you are looking to challenge your knitting skills as far as colorwork, I highly recommend giving these a try. 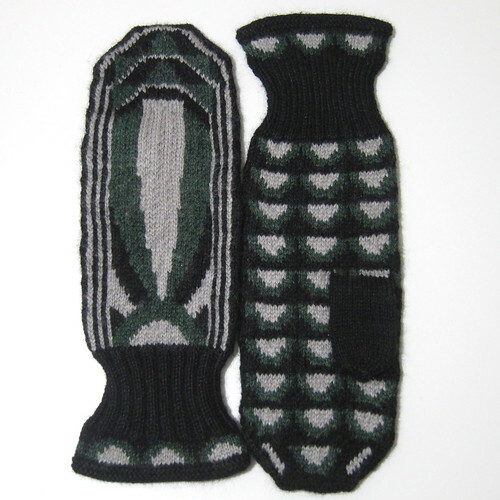 This pattern makes a pair of mittens that are 7.5″ (19.05 cm) long (not including the cuff) and 8″ (20.32 cm) around. 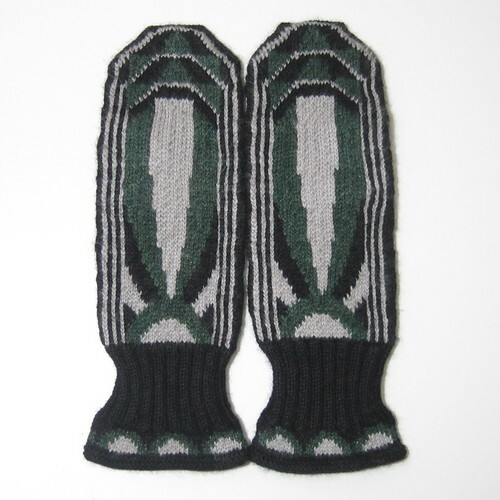 Download the full Art Deco Mittens Pattern or just the Art Deco Mitten Chart. kfb – knit front and back – knit into the same stitch twice, once into the front and once into the back. Increases one stitch. ssk – slip, slip, knit – sip two stitches as if to knit. Put them back on the left needle and knit them together. Decreases one stitch. 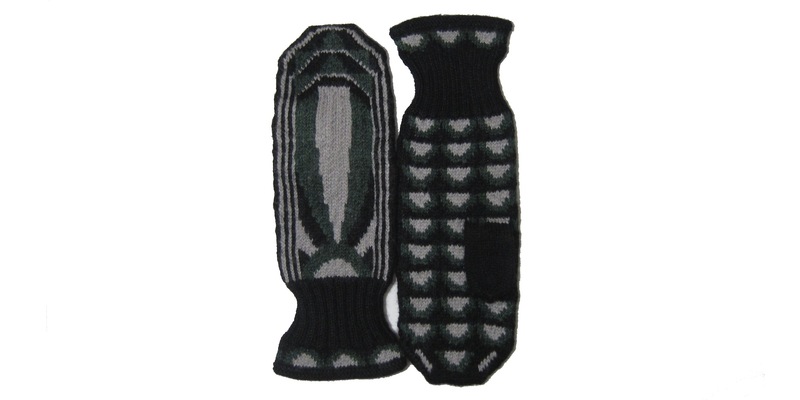 k2tog – knit two together – knit two stitches together. Decreases one stitch. With the black yarn, cast on 72 stitches. Divide between three needles. Join to knit in the round being careful not to twist the stitches. Place a stitch marker between the last and first stitch to mark rows. Repeat row 15 for desired length. My cuffs are 3″ (7.62 cm) long. Note about thumb placement: I have placed the thumb at 3″ (7.62 cm). I recommend trying on your mittens or measuring your hand to place the thumb exactly where you want it. Row 34: Other than the 11 stitches you knit onto the scrap yarn, you will still be working the hand chart. (left hand) k24, k11 onto scrap yarn, slip those 11 stitches back onto the left needle, k until end of row. Rows 35 – 71: continue working chart. Keep working chart while doing decreases. You will be decreasing 4 stitches per row. Cut yarn leaving about a 12″ (30 cm) tail. Seam using the kitchner stitch. Carefully removed the scrap yarn putting the stitches on two needles, one for the top stitches and one for the bottom stitches. You should have 11 stitches on each needle. Knit in the round until about 1/4″ (6.35 mm) from the top of the thumb. Cut the yarn leaving about a 6″ (15.25 cm) tail. Put the tail on a tapestry needle and weave through remaining stitches. Pull tail inside the mitten and pull the stitches tight. For personal use only. Do not duplicate for distribution, repost, sell or teach without permission. WOW! These are just beautiful. Yes, I agree with Kim – those mittens are beautiful. I love the colors! You did such a wonderful job! I have got to make these next week. Have to find a nice soft flannel to line them with. fyi: both pdf’s are the same … they contain only the chart. please let me know when the full pattern is available. Thanks for letting me know, it should be fixed now.